I just received a new Conid King size Bulkfiller. I ordered a Streamline (rounded cap) with Titanium nose and tail fittings, Fine Rhodium plated gold nib. I also asked for a yellow ink window and my user name etched on the clip. I ordered the pen in December and received it on 2/28. In the box there were two beer coasters, a pad of Conid engineering paper and the wonderful metal case with the pen and it's tools. My first impression is the size, it is big! I like big pens, but this one seems really heavy. I also have one of the Aurora Sigaros which is a HEAVY pen and I like the feel of it, but the Conid just seems different. It could be that I have been writing with Nakayas recently so it seems really heavy compared to the Nakayas. This is an Engineers pen, everything about it is precise and perfectly designed. The Engineer in in me is totally in love with the design! I have not filled it yet, I am waiting for a new ink to christen it (Organic Solutions Edgar Allen Poe Red), but I dipped it in my trusty bottle of Momji and wrote a bit. what was really interesting was how much lighter the ink appeared than with my Medium Nakaya I was using on the page. It was about two shades lighter. I tried it on another ink and it also came out lighter. Still undecided on this pen, it a fantastic machine, but feels "different" in my hand. Edited by oldrifleman, 01 March 2017 - 17:54. This model is my dream pen. I had the same initial reaction to the Conid. Heavy, tiring. However, over a short time I found that I became accustomed to it. That weight is distributed well and the pens is so solid. Now, it feels right somehow - but it will always be an SUV as opposed to a sedan. In contrast, my other heavy pens (brass bodied Jinhao 159s and the like) never get to the state of feeling right. They remain heavy and clunky. Give the Conid a couple of weeks of daily use before dumping it. I plan on it, I have a nice dark red and a better blue coming in the email today, and I will give it a couple of months before I make up my mind. As I said, as an engineer, I absolutely love this pen, just I have become used to writing with my Makayas which are really light. I am waiting for mine... so excited! Thanks for sharing. The yellow ink window gives it just the right splash of color! My first impression is the size, it is big! I like big pens, but this one seems really heavy. I also have one of the Aurora Sigaros which is a HEAVY pen and I like the feel of it, but the Conid just seems different. It could be that I have been writing with Nakayas recently so it seems really heavy compared to the Nakayas. This is an Engineers pen, everything about it is precise and perfectly designed. The Engineer in in me is totally in love with the design! I have not filled it yet, I am waiting for a new ink to christen it (Organic Solutions Edgar Allen Poe Red), but I dipped it in my trusty bottle of Momji and wrote a bit. what was really interesting was how much lighter the ink appeared than with my Medium Nakaya I was using on the page. It was about two shades lighter. 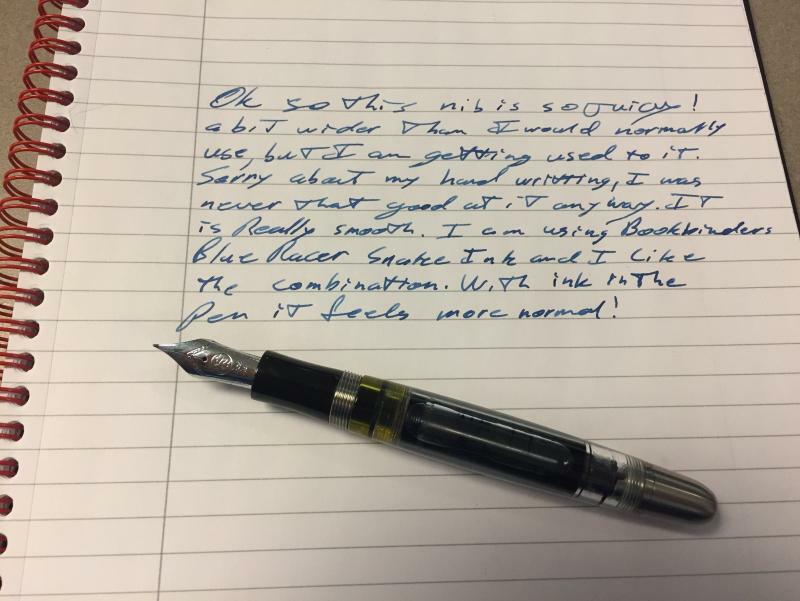 I tried it on another ink and it also came out lighter. Still undecided on this pen, it a fantastic machine, but feels "different" in my hand. Thanks for your honest preliminary review! I use a Kingsize CAISO demonstrator as my daily writer. This version also features the titanium section and knobs. I do understand the pen initially does feel heavy, surely compared with a lightweight Nakaya, but 'm sure you will get familiar with it after using the pen for some time. As specified on the Conid site the full demonstrator weighs 41 grams, mainly due to the titanium knobs en section. Note the ebonite Kingsize version - featuring a demonstrator barrel - weighs only 30 grams. This happens to be a good alternative for users which prefer lighter pens. Look forward reading on your further experiences ! So today I inked up the pen with BookBinders Blue Racer snake ink. I like the combination, with the pen unposted, and filled with ink, it feels more balanced and the nib is really smooth, no hard starting, and it runs really wet, just like I was expecting. There is not a lot of flex from this nib, but then I think that is sort of reserved for the Titanium nib. I can now say however that it is now a definite keeper and will join a Danitro and a couple of Nakayas in regular rotation. I believe the this blue ink will be reserved for this pen however. Location:On one peninsula or another. It is a beautiful pen. I am considering a Pilot Custom 823 which looks similar from Tokyo. Conid has lots of options, worthwhile ones. Remember that on a bulkfiller there is the main ink supply but there is also a secondary supply which is what is used to write with. Like an Eye dropper the plunger cuts off the ink flow into the section, which in this case is also the secondary ink supply. The ink window allows you to see how much ink remains in the secondary, when that gets low you open the plunger rod a bit and refill it. I was wondering the same thing but good response and I think the splash of colour does look smart. Gorgeous pen. 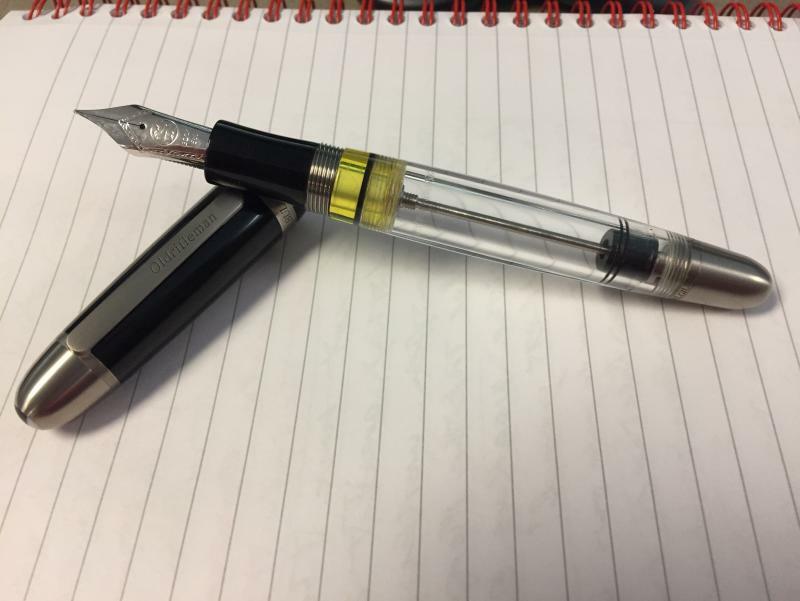 I didn't know Conid made a non-Caiso with titanium knob? In any case, congrats on your purchase! For the record, I've never felt this was a heavy pen though obviously that's subjective. For me it's "just right". The titanium knobs are not one of their standard options. I asked for them, expecting an extra charge, but they just made the swap. It is not really heavy, the Aurora Sigaro I think may be heavier, but the weight distribution is different. Very nice! Now I'm kicking myself for not speaking up and asking for the same --aesthetically I wanted something that resembled the CAISO but without the added cost of the actual CAISO system. Certainly nothing to complain about as I'm quite pleased with my Conid. Really nice pen, many thanks for sharing. I never thought about swapping the knobs, but that titanium trim certainly looks cool. 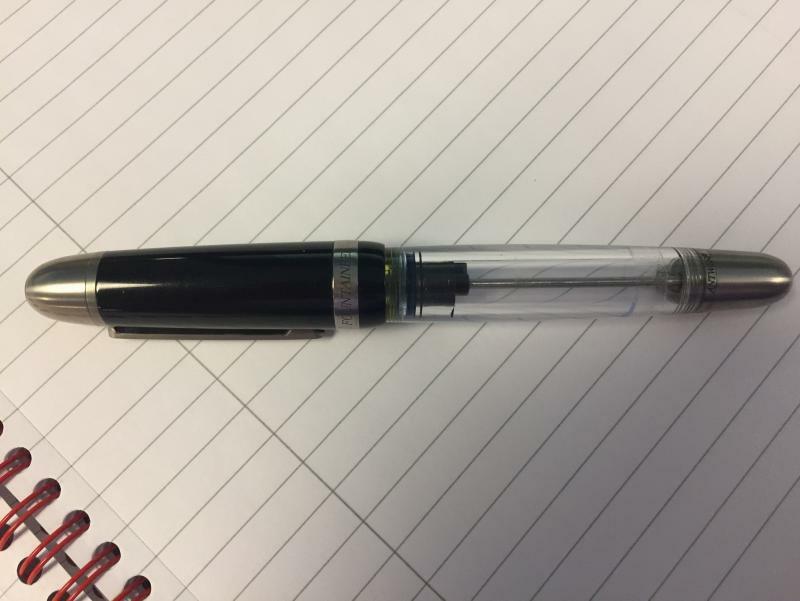 Could you torture help me by showing the pen capped as well? Edited by oldrifleman, 09 March 2017 - 21:01. Thanks for this, a very cool 'steampunk' pen. Very very nice. I have not one but two King Size ....and I'm still envious! It would be so nice to try in hand the pen before I will buy it - alas, there is very small chance I will be around Antwerp. I have a feeling that more suitable for me would be model Regular, but who knows?